When we think about strudel, we usually imagine the delicious pastry roll filled with apples, raisins and cinnamon, which is a traditional dessert of Trentino Alto Adige. The term derives from the German word “strudel” which means vortex; in fact, this stuffed roll, made with a very thin dough, is typical of the Italian regions that were part of the Austro-Hungarian Empire. The version that I propose here uses a different filling: fresh seasonal vegetables, sautéed in olive oil and flavored with fresh mint. A touch of robiola (anItalian soft-ripened cheese of the Stracchino family, (see focaccia di Recco) gives a creamy taste to this recipe. 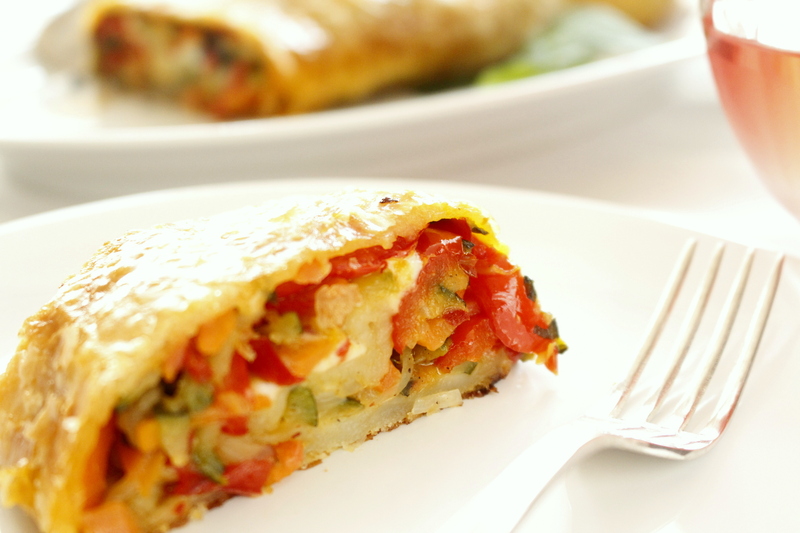 This tasty strudel is ideal as an appetizer or light vegetarian lunch. The preparation is quick and simple, and I recommend using puff pastry to speed things up. The traditional strudel dough is made of flour, oil and water and is pulled very thin, until it’s almost transparent; this is the secret and also the hardest part! You can also prepare the strudel in advance and then heat it in the oven a few minutes before slicing and serving. Happy New Year all my beloved readers. Buon Anno! Tonight I am going to serve cotechino in crostra with lenticchie. 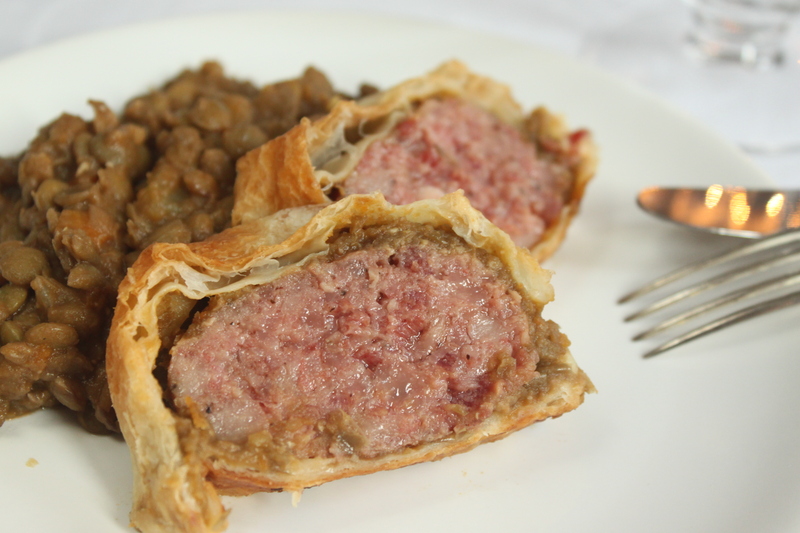 Cotechino (the Italian fresh pork sausage) in puff pastry is a tasty and appetizing idea to enjoy the traditional cotechino and lentils during the Christmas holidays, and particularly at New Year’s Eve. According to the tradition, it seems that this dish is a good omen for the new year, lentils are, in fact, symbol of abundance and fortune. The preparation is simple, but requires a little patience. First cotechino is cooked in water, then covered with a delicious lentil puree, wrapped in a sheet of puff pastry and baked in the oven. The result is a crunchy topping with a tasty filling, full of flavor. The pork sausage with lentils is a simple dish that dates back to the farmers’ tradition. Cotechino owes its name to the pork rind and is prepared by filling the gut with pork rind, meat, fat, all flavored with salt and spices. It is a type of sausage that is eaten cooked. It originated from Modena, but nowadays it is spread all over the country with some variations in spices. It is commonly sliced thick and laid on a bed of lentils. You can also enjoy it with mushed potatoes, sautéed spinach or polenta. Brie wrapped in puff pastry and baked until the cheese is hot and gooey and the crust is golden brown … mmmmmmm! This is an elegant and tasty appetizer to serve at a dinner party to please and impress your guests. It’s probably one dish that you don’t want to eat all the time (full of calories! ), but when you do it is heavenly. Try it on either toasted Italian bread or your favorite crackers. 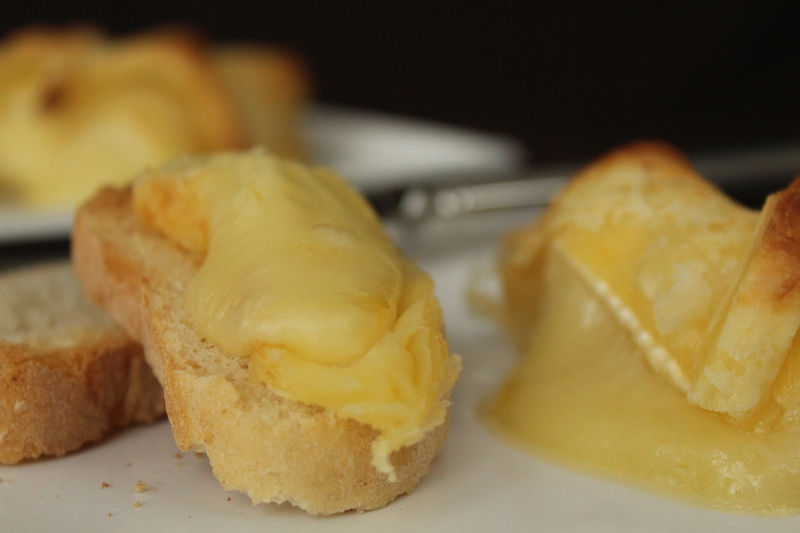 To fully enjoy Brie’s taste you have to eat it with its rind, a integral part of its flavor. Some cheeses are conserved in plastic wax or even natural rinds that have, however, an unpleasant taste; Brie’s rind, on the other hand, adds a pronounced and distinctive taste to the cheese, so please do not remove it. Brie is a soft French cheese named after the French region Brie, where it was originally created. It is a rich cheese but also a good source of protein, vitamin B12 and vitamin B2. It is a popular cheese in Italy, even though we have a very similar one called Camoscio d’Oro. 7. Let cool for 15 minutes, and serve with toasted bread or crackers. 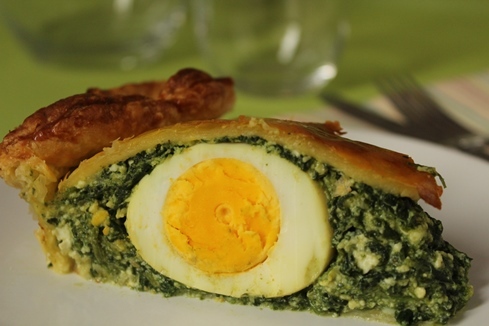 Torta Pasqualina is a rustic savory pie typical of Liguria, filled with spinach, ricotta cheese and eggs. You can serve it as an appetizer with a nice sparkling wine (I love it with my Prosecco) or as an antipasto (starter) anytime of the year, but this dish is really part of the traditional Easter (Pasqua) dinner or served at the Easter Monday (little Easter, “Pasquetta”) picnic with family and friends. In fact you can prepare it a day in advance and enjoy it cold the next day. Torta Pasqualina traces its origins back to 1400 when it was prepared to celebrate Easter Sunday after Lent, a period of time marked by fasting. Catholics during Lent historically gave up more than just meat dishes – eggs, milk, and even fat were abandoned. According to the ancient tradition, 33 pastry layers were used (like Jesus’ age at his passing), while the eggs represented life, fertility and renewal. The ingredients (spinach, cheese, eggs and pastry) were something special, a celebration of the Easter feast. Nowadays the recipe calls for a fewer layers of pastry, and artichokes sometimes substitute spinach. Torta Pasqualina is an absolute hit for everybody who eats it – even kids like it! The perfect combination of spinach, sautéed onions and creamy ricotta cheese is its secret while the hidden eggs add a special surprise. 6. Bake until golden, about 40 minutes. It is delicious when eaten freshly baked and a little bit warm, but it is also a treat to enjoy cold the next day.